Large Farmhouse with Lake Willoughby frontage - it's our Deal of the Week! This charming year-round property in Westmore, VT has been used as a 4-unit residence for the last 50 years, with a strong rental history. Would make a very nice family compound, or continue to use as rental property or revert back to a spacious single family home on the lake. Has over 250 feet of sandy beach on one of the prettiest lakes in the entire Northeast Kingdom. Priced below town assessment, making it a real deal at $399,000. Click here for more information and contact Dan Maclure to see this property. Wonderful year-round home near Lake Willoughby in Westmore, VT - it's our Deal of the Week! This four bedroom, two bath home has been lovingly maintained by its original owners and awaits its next owners. Open living concept on the main floor with a centrally located wood stove to keep you toasty. Updated kitchen has new appliances. Huge western-facing deck overlooks the 6.7 acre property with lake and mountain views. This property is priced well below town assessment at $194,900, making it a real deal! Click here for more information and contact Nick Maclure to see this property. Rarely does an offering like this come along.......it's our Deal of the Week! 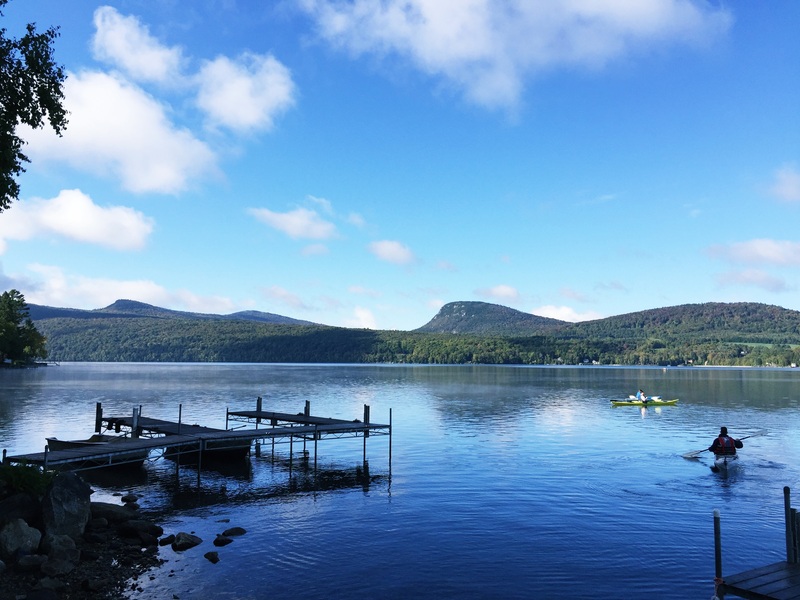 This is truly THE most pristine compound on all of Lake Willoughby in Westmore, Vermont. Year-round home and 10 two bedroom seasonal cottages on 4.34 acres, with 322; of private lake frontage. All cottages have beautiful stone fireplaces and four also have a wood stoves. If you are looking for a lifestyle change with income, this is IT! Tremendous repeat clientele; we can see why! $1,675,000. Click here for more information and contact Steve Peacock to schedule a showing. This beautifully cared for home in a private setting on Lake Willoughby in Westmore, Vermont is our Deal of the Week! The first floor has high ceilings with exposed natural beams and a two-sided brick fireplace that serves both the living room and updated kitchen/dining area. First floor bedroom, with two more bedrooms on the second floor, both with beautiful wood floors. Huge wraparound deck overlooks one of Vermont's prettiest lakes, Willoughby! Your own 70' of private frontage with sandy beach, dock and deck on the water. Also includes detached one-car garage. Total acreage, .37A; $329,000. Click here for more information and contact Steve Peacock to see this wonderful home. Beautifully updated waterfront home in Westmore, Vermont - it's our Deal of the Week! This year-round home has 101' of private frontage on Lake Willoughby, one of Vermont's most beautiful lakes. Remodeled kitchen, spacious living/dining area and sun room with views of the lake, three bedrooms and two bathrooms. There is an attached deck and another deck and boat dock, making this a Summer paradise! And when the weather gets cold, cozy up to the fireplace. A true all-season retreat! $495,00. Click here for more information and call Peter Lanoue to see this wonderful property. Buy this lovely lakeside cottage now and spend this Summer on Lake Willoughby! It's our Deal of the Week! This is a great 2 bedroom/1 bath cottage in Westmore, VT with 276 feet of shared lake frontage. Priced at just $136,000 and association fees are only $600 for the entire year and include trash & water. What are you waiting for? Click here for more details and contact John Stevens to see this property. Hi Melissa! Welcome to the wonderful world of real etaste! That's a great question for you to ask your RE Teacher. Also, are you planning on working with a large re company or an independent? My suggestion is start off with a business plan. Notify your sphere of influence .tell your family, friends, neighbors, so they will tell their family, friends, neighbors, etc., send out announcement cards, then follow up with phone calls to your sphere. Word of mouth is the best advertising and it's free. Try to get a listing so you can meet buyers. If you can't get a listing soon, offer to do as many open houses for other agents as you can. Get out there and network. Go after expireds and fsbo's. Have many things going on at a time because wasting time means there's a gap between paychecks. I have quite a few active buyers right now, some I have just recently met and others I have been showing properties to for the past 4 to 5 months and some longer. Anyway, typically, 45 days to closing and then you get paid. Good Luck .any questions, feel free to email! ALL OFFERS CONSIDERED!!!! Brand new house- 1 mile from beautiful Willoughby Lake Beach. Located across from protected Town Forest. Bike, hike & snowmobile from the property. Energy efficient two level home with southern yellow pine floors on the main level, exposed beams, southern exposure. Open kitchen and dining area, spacious full bath, upstairs are two bright bedrooms. The full basement could house a family room or ad a garage with bulkhead. Easy to heat, on demand hot water. DSL Internet. Paved road. Beautiful setting framed by a tree buffer and stone walls, but a nice yard for gardens. Listed at $112,500.